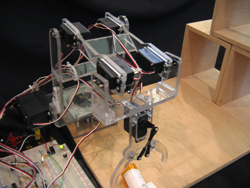 This project was first meant to be a prototype for a robotic arm that was to be controlled over the internet. It was adapted for the TSA catagory of Engineering Design. The arm uses two Futaba 3306 high torque servos at its base and six additional Futaba 3004 servos for the claw, wrist, elbow, and turntable. Five PIC 16F84A microcontrollers work together to control the separate arm components. The power source for the logic circuirty is a 9 volt battery reduced to 5 volts by a 78L05 voltage regulator. A 6 volt AA battery pack powers the servos.